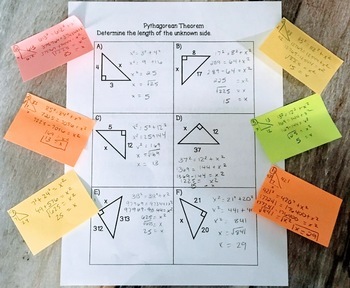 Everyone LOVES sticky notes and now your students can use them to complete this worksheet! 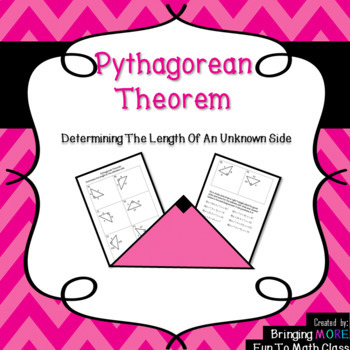 In this activity, students will use Pythagorean Theorem to solve for unknown sides in right triangles. Students will complete the first 8 questions on the space provided on the worksheet. 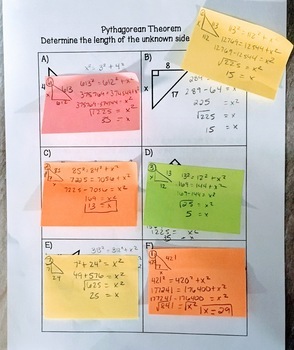 The last eight questions students will use their sticky notes to draw the triangle and solve for the unknown side. To check their answers they will match their solution on the sticky note to the one of the solutions in the first 8 questions they completed on the worksheet. See tips in the downloaded package for strategies I have used to make this activity a success! Questions: A total of 16 questions to complete. All triangles have integer sides. 8 triangles are drawn with the missing side indicated by ‘x’ and 8 triangles are listed as ‘ a = ___, b=____, c=____ with a ‘?’ indicating the unknown side. 5 triangles have the hypotenuse as the missing side and 11 triangles have one of the legs as the missing side. Level of Difficulty: Basic Pythagorean Theorem worksheet. Time For Activity: 30-40 minutes. Prep Required: Print out worksheet and make sure each student has 8 sticky notes.